Punalu’u Black Sand Beach on the Big Island of Hawaii. There are many unique and colorful beaches in Hawaii. The distinct minerals and geologic aspects of Hawaii have greatly shaped the composition of many of its beaches. Below are some of the most unique coastlines you can find in Hawaii. Not until you have walked there, can you truly appreciate this unique black sand beach. As result, this beach on the Big Island is probably the most popular of unique and colorful beaches in Hawaii. Volcanic lava that flowed to the sea created this beach. Once hot lava hits the ocean, the resulting explosion creates gains of black sand on nearby shores. 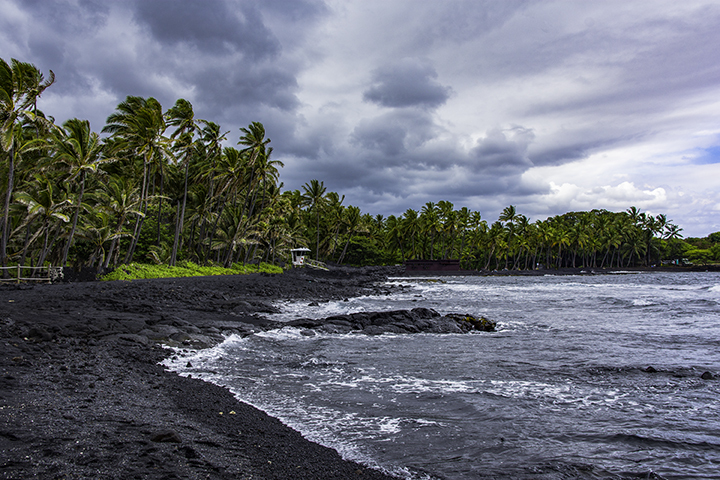 Experiencing these Hawaiian black sand beaches is a must-do for beach lovers. For all who appreciate nature, this beach is a testimony that the sea can sometimes render worthless things into something timeless. Here, waves continually tossed bits of glass into smooth brightly colored shapes. The soft, sea-washed pebbles of glass create a warm, colorful and shiny appearance, though a little difficult to walk on. Still, this beach is a definite must-see for any traveler to Hawaii. Papakolea Green Sand Beach, one of the unique and colorful beaches in Hawaii. Photo by Edward Hon. Hawaii is one of the few places in the world that has a beach of a jade hue. Green beach or “mahana beach” gets its bright green color from the mineral olivine in the cliffs over the shore. The nearby cinder cone, a steep conical hill of tephra (volcanic debris), is beaten by the wind and waves causing it to break down into granules of sand. 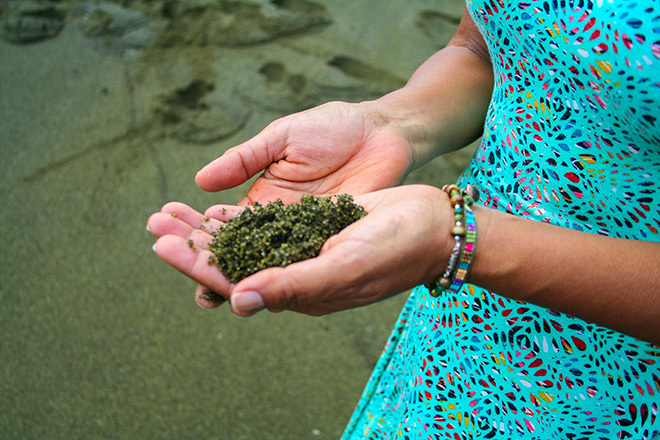 The olivine-rich rock crumbles into crystals and rough sand, resulting in a decidedly green shore. This is an extremely rare kind of beach, as there is only one in Hawaii and few on the planet. Though Papakolea is not an easy cove to travel to, it is a once-in-a-lifetime place to visit. Known as the “Red Sand Beach,” the granules of color are a dark red in the dust. The sandy stones the come from the cinder cone hill that slowly disintegrates and contributes to the sand color. Its granules are a mix of red and black. The beach is a difficult beach to find, as it follows a steep and narrow hike. While visitors need to be aware of the challenge, the trip is well worth a view of the crimson cove. While this might seem like a strange name for a beach, the sand on this beach is said to bark like a dog. Because of a certain kind of quartz in the sand, when rubbed together, the grating sound is not unlike that of a yapping puppy. The pools here make for “swimming hole” type of experience without having to swim very far out. Here, pahoehoe black lava has created pockets of seawater next to the shoreline. In such areas, you can find some of the loveliest places to swim and watch marine-life. They are also optimal places for snorkeling. This is because there tends to be a varied amount of fish and sea-creatures in these underwater holes. Geothermal heat even warms a nearby pool in the park. While you may be thinking of sparkling white beaches, remember there are many other unique and colorful beaches in Hawaii. Definitely check them out the next time you’re there.